Imagine a snowball, cold and wet and compacted between your hands. Now, imagine that you roll that same snowball down a mountain. As the snowball starts rolling down the mountain, it begins to gather more speed. It also gets much larger, as more snow is packed onto its surface. By the time the snowball reaches the bottom of the mountain, it is no longer small, fluffy, and innocent. Instead, it is quite large and possibly dangerous. This is roughly the same manner in which many community problems take shape as well. They start out small, affecting only a handful of community members, but they can quickly grow out of control. Examples of some community problems can include poverty, and cultural or racial prejudices. Problems such as these can often lead to additional problems, like widespread psychological issues, substance abuse, and increased school dropout rates. Other issues might also affect the health of a community as a whole. A traumatic event or disaster, for instance, will often turn a community upside down. The suddenness of an event such as this - such as a terrorist attack or devastating natural disaster - combined with the loss of property, possessions, and loved ones can result in an increased amount of psychological disorders. Community counseling is a type of counseling that is used to help communities that are suffering from psychological or social discord, for one reason or another. Professionals in this field will often try to treat individuals in the community for whatever psychological problem that ails them. They will also attempt to prevent future problems as well. In order to begin a community counseling career, individuals must possess a few very important traits. For instance, they should have excellent communication and leadership skills. Communication skills enable these professionals to connect with and better understand the problems and causes of problems that some communities may face. Leadership skills are important, because they help community members feel more trusting and willing to follow the advice of community psychologists. How Do I Become a Community Counselor? To become a community counselor you will need to go through a rather rigorous amount of schooling. This includes obtaining a Bachelor's Degree, then a Master's Degree, and finally entering into a Doctorate or PhD program. If you are serious about entering into this field of study, request information from programs available for you here. Why Do We Need Community Counselors? Everyone wants to live in a relatively peaceful community, and the majority of people prefer to be proud of their communities rather than ashamed of them. Problems running rampant in a community, however, can make it difficult to feel this way. Issues and problems suffered by older generations in a community will also often be adopted by younger generations, making them difficult to put an end to. Community counseling, however, can help prevent this vicious cycle. Professionals in this field are experts at treating problems of individuals as well as communities. They are often experts at getting communities to pull together during tough times and restore order and harmony. What Does a Community Counselor Do? Community counselors attempt to solve widespread community problems that are social or psychological in nature. 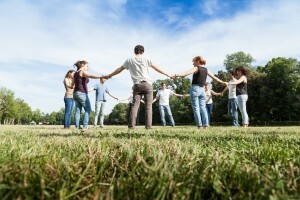 In order to do this, they will often work with individuals as well as a community as a whole. There may be a number of different problems that can plague individuals in dysfunctional communities. Many of these problems are often related. Community counselors will often speak with several individuals, offering guidance, therapy, and counseling. While trying to help these individuals overcome their challenges in life, though, a community counselor will also attempt to get to the root of the problem. Not all community problems stem from such things as social and psychological problems within the area, however. Disasters and traumatic events can often rip a community to shreds in a very short period of time. These may include such things as natural disasters or acts of man. Some traumatic events that may rip through a community may include floods, tornados, hurricanes, earthquakes, wildfires, war, and terrorist attacks. Events such as these will often make communities as whole feel scared, confused, angry, depressed, and anxious. These feelings could stem from the loss of homes, property, loved ones, and stability in general. After a community wide disaster, community counselors will often be available to individuals in need of counseling for various mental and emotional problems caused by the disaster. This can be achieved by individual counseling sessions or group counseling sessions. Community counselors might also help a community unite and rebuild in the aftermath of such an event. Where Do Community Counselors Work? Community counselors might be employed by a number of different facilities and agencies. They might work in hospitals, substance abuse clinics, mental health centers, and schools. They might also be employed by social service organizations, non-profit groups, and government agencies. What Are the Education Requirements to Become a Community Counselor? Earning a bachelor's degree is typically the first step toward a community counseling career. Individuals pursuing careers in this field will often earn degrees in counseling, social services, psychology, social psychology, or sociology to begin with. A master's degree in community counseling, however, is usually necessary before becoming certified or licensed. In many cases, students earning master's degrees in community counseling are also required to complete an internship as well. Get further insights about a community health counseling degree. What is the Median Salary of a Community Counselor? Mental health counselors made an median salary of $42,590 in 2011, according to the Bureau of Labor Statistics. The highest paid professionals in this field were employed by local government entities, making $51,200. However, the median salary of a community counselor can vary depending on a number of factors, such as location, education, and experience.